The Marriott Marquis’ Imperial Ballroom will provide a venue for the display of numerous works of art throughout this year’s Annual Meeting, including panels of the AIDS Memorial Quilt, a multimedia exhibit of the Buddhist Oxherding pictures, and pieces from two featured Atlanta artists, Guy Robinson and Keith Prossick. Several AIDS Memorial Quilt blocks will be on display. 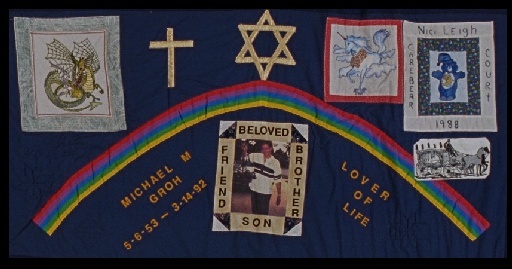 Each “block” (or section) of the AIDS Memorial Quilt measures approximately twelve feet square, and a typical block consists of eight individual three-foot-by-six-foot panels sewn together. Virtually every one of the more than 40,000 colorful panels that make up the Quilt memorializes the life of a person lost to AIDS. This exhibit will feature examples of the Oxherding Pictures from around Asia and America from the earliest extant manuscripts to recent artists who have adapted the Pictures in a variety of media, including sculpture, porcelain, music, and film. The Oxherding Pictures are a central feature of Zen Buddhism, and no one has collected the diverse examples together in one place to demonstrate the vitality of the Oxherding tradition. The exhibit as a whole attests to the vitality of visual religious culture. This session is an opportunity for two of Atlanta’s premier artists who work with religious subject matter to discuss their work, its relation to religion, and their philosophies of art. Guy Robinson’s surrealists works have been exhibited in numerous galleries and have a place in important collections including the Georgia Museum of Contemporary Art. Keith Prossick, a self-taught artist, works with mandalic forms built from the principles of sacred geometry. He has shown his work at many venues and events in both Georgia and New York. Prossick lives and works at the Colaboratory, a “maker-space” for self-defined artists to work on projects in collaboration with others. Associate professor of music theory and African American music, Dwight Andrews is also senior minister of the First Congregational United Church of Christ in Atlanta. In 1998 he formed the Atlanta Jazz Chorus, a group whose mission is to perform the sacred works of famous jazz masters — such as Duke Ellington — and to bring out spiritual aspects, ideas, and issues in public performances. The group — composed of thirty-five singers from the metro-Atlanta area — has rapidly gained an expansive and dedicated audience base.